Why would Ben, a four-year-old mutt who'd found the perfect forever home, run away and go all the way back to the shelter? The answer: He didn't want to leave Jade behind. Courtney and Jason Lawler had seen the two dogs together, but they only wanted to adopt one, and everyone thought it would work out fine. But Ben apparently couldn't see his way to living without her. 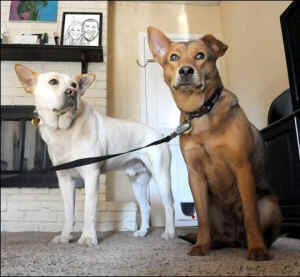 The pair had lived as strays in Terre Haute, Indiana, and people at a diner had been putting out food for them. When Jade had puppies, one of the staff at the diner took the puppies and their parents to the shelter. Three weeks after adopting Ben, Jason was taking out the trash. Ben saw his opportunity and bolted. The shelter was 10 miles away, but he arrived back there the next day. The street-savvy dog was wary of being captured, but Jade saw him and came out of her kennel, and the two sniffed and licked and kissed each other through the fence. It took the staff several hours to catch Ben – in the end they had to use a tranquilizer dart – but eventually the two dogs were together inside. When Jason and Courtney came to pick him, they took Jade home, too. Debbie Floyd, president of the Terre Haute Humane Society, said that neither dog had known much love from humans. "They found love with each other and that what’s make them happy … Hopefully, they will live their lives happily ever after." That's what Courtney and Jason want for them, too.